The Internet is one of the most important features embedded into the new Samsung Galaxy S5 smartphone. It allows phone users to browse the web, send/receive email messages, install apps, and stream videos and music online. Typically, GS5 users can access the Internet once they've inserted the SIM into the phone. Another option to access the Internet on your device besides using the SIM is through manually setting up GS5 for Internet. Step 1. Locate the "Access Point Names" on your phone. 1.1. Simply slide your finger down the screen starting from the top edge of the device. 1.2. Touch the Settings icon located on the upper-right corner of the screen. 1.3. From the settings menu, locate and touch More Networks option to continue. 1.4. 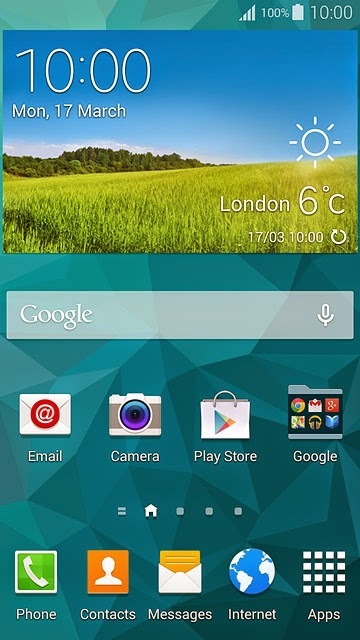 Touch to select Mobile networks from the More networks menu. 1.5. The Mobile networks screen will appear. Touch Access Point Names to proceed. Step 2. Create new data connection by touching the + sign or the new data connection icon located on the upper-right corner of the APNs screen. Step 3. You will be prompted with a new screen to Edit access point. From the given options, touch Name to set the data connection name. Step 4. Enter a unique name you prefer for your Internet connection and touch OK to continue. Step 5. Touch APN to configure APN settings. You may need to contact your carrier to verify the right APN settings for your device. Example: Vodafone GS5 handset’s APN is live.vodafone.com. Touch OK to proceed. Step 6. Touch MCC and key in the correct country code (272). Then touch OK to continue. Step 7. You will also need to enter the network code. To do so, touch MNC and key in 01 on the MNC dialog box. Touch OK to continue. Step 8. The next thing you need to do is to choose authentication type. Touch Authentication Type then select PAP from the given options. Step 9. Set the APN type by touching the APN type option. Just enter Default and touch OK to proceed. Step 10. Configure data bearer by touching on the Bearer option. You will see options for LTE, eHRPD and Unspecified. Touch to select “Unspecified” next. Step 11. Save and activate your data connection. To do so, look for the menu icon on the upper-rightmost corner of the screen. It will prompt you with the Save and Discard options. Touch to select Save. To fill in the field, simply touch the field next to the data connection (typically represented by an emphasized green dot icon or radio button). Step 12. Go back to the Home screen by pressing the Home button of the device. Use the phone's Internet browser and attempt to connect to the Internet using the network you've just set up manually. Step 1. Locate and touch the Internet icon to get started. Step 2. Key-in the web address or URL you want to visit on the address bar. Step 3. Touch Go to continue to the website you've specified. Step 4. You may opt to add the current web page/website address into your bookmarks so you can easily access it the later. To do so, touch the bookmarks icon and the add bookmark icon. Key in the name of your bookmarked page and touch Save to continue. Step 5. Go to bookmark to visit any of your recently bookmarked pages. Just touch the bookmarks icon and touch the required bookmark to proceed. Step 6. Once done browsing the Internet, go back to the Home screen. Simply press the Home key to get you back home.